Are you a die-hard New York Yankees fan? 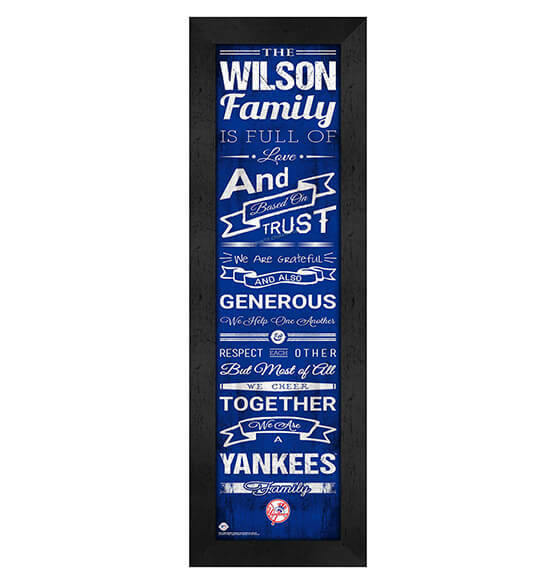 Show your love for the Yankees and your family with our Personalized Family Cheer New York Yankees Wall Art from PersonalizedThings by Exposures. With its heartwarming sayings and easy customization with your family's name, you can create a treasure to hang in your very own family room. Featuring a ready-to-hang sawtooth hanger, quality glass and vinyl-wrapped vibrant printed paper in team colors, this custom framed wall print is also an ideal gift to give for anniversaries, birthdays and holidays. Make a special event even more special with this personalized baseball gift that they will cherish for a lifetime!